With the almost incessant scandals that emerge from the world of football it's refreshing to find that some players can behave themselves. Take Didier Drogba for instance - the Chelsea star married his long-term partner this weekend in a private ceremony minus the opulence commonly associated with the world of millionaire footballers. 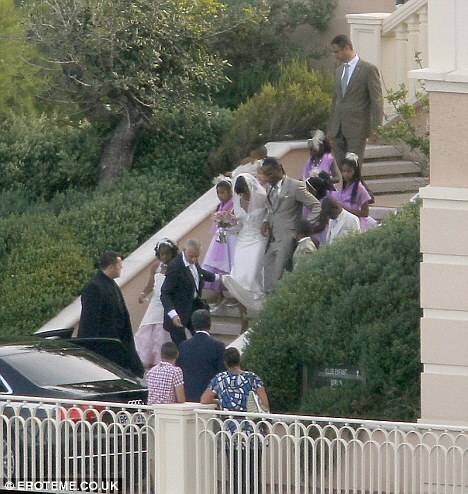 Drogba, 33, tied the knot with Lalla Diakite at the at the Marie de Monaco in Monaco. The centre forward sported a simple grey suit for the ceremony, while his wife also kept it relatively simple in a plain white gown. Meanwhile the bridesmaids wore lilac outfits. The ceremony was officiated by club owner Roman Abramovich, with his team-mates Salomon Kalou and Florent Malouda among the groom’s men. 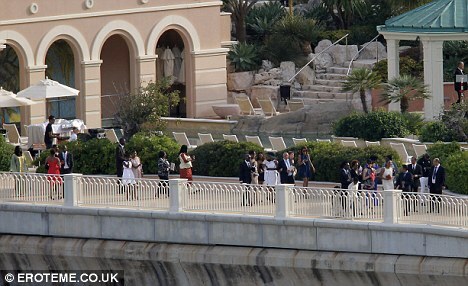 RnB superstar Akon and a host of stars from NBA were also said to be included on the list of guests for the event. Didier also flew in singer J.Martins from Nigeria. The football is said to be a fan of the singer after hearing his collaboration with Congolese music star, Fally Ipupa, on the song, Jupa Remix. 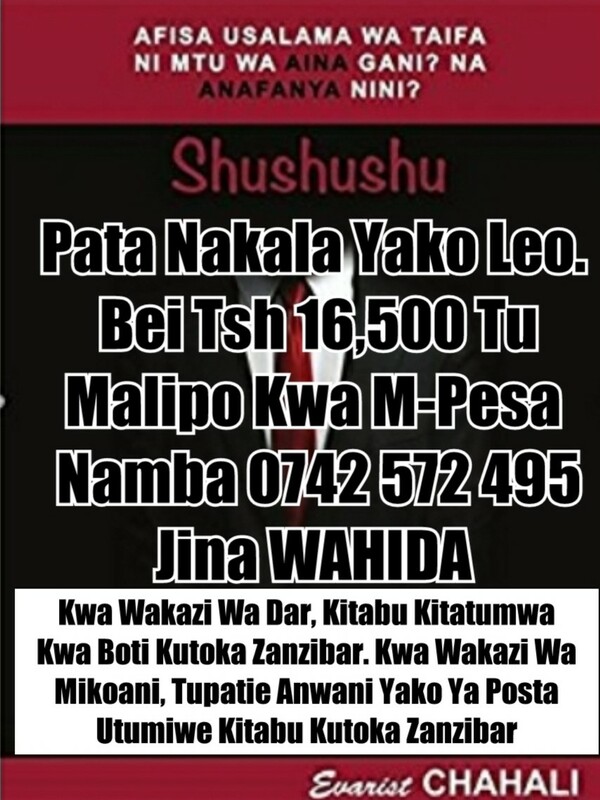 In fact, according to a source it was originally Ipupa who was invited to the wedding, a source says. The source claimed: 'Drogba really loves the song and he thought it was Fally Ipupa’s. Didier and his bride met in 1999 when he was in the early stages of his career in Paris, they have three children together and maintain a relatively private life apart from Drogba's infrequent visits to west end clubs with his team mates. 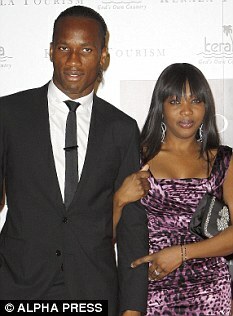 And, although the setting and guestlist were both indicative of the football star's wealth, Drogba kept his day as simple as he could. 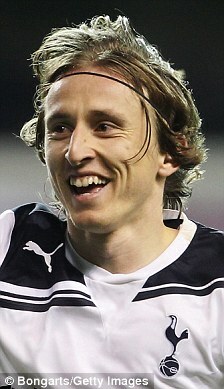 A source told The Sun: 'Didier isn't interested in celebrity magazine deals or needless expense. Meanwhile, one of Drogba's good friends, Ghanian star Michael Essien, travelled 3,000 kilometres to make an appearance at the wedding. Essien took part in Nigerian star Kanu's testimonial game on Saturday and flew to Monaco so he could honour his commitments to both men. 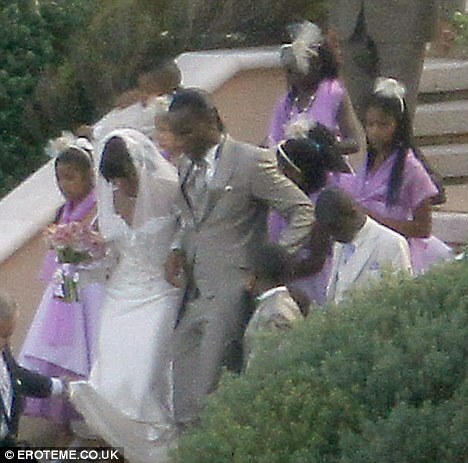 Chelsea star Drogba wasn't the only footballer with wedding news this weekend. 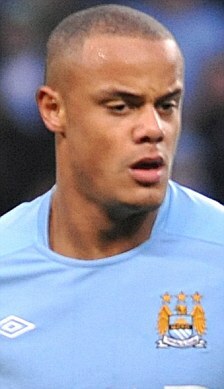 Manchester City player Vincent Kompany and Tottenham's Luka Modric also wed over the weekend. 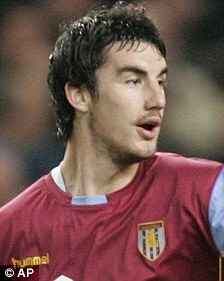 While Birmingham City player Liam Ridgewell called off his £170,000 wedding by sending a text to guests just eight days before the ceremony. 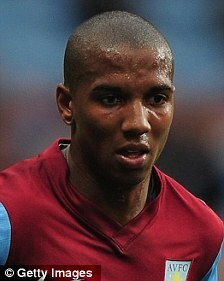 The defender, 26, had planned to tie the knot with girlfriend Kirsty Maclaren, 23, in front of 200 people next Saturday. Instead they sent a message saying it was cancelled.